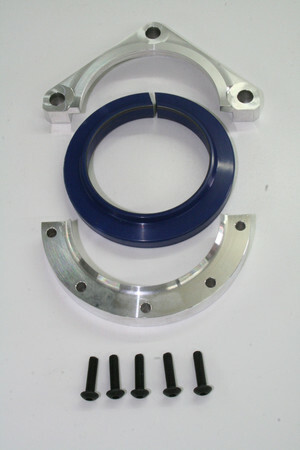 CST3002 - Rear main seal kit, 2.0-in. main 1275 only. Having tried all manner of methods to prevent oil leakage from the rear main of the in-line A-series engines, including the seal kits already on the market, I decided they were all a lost cause. Nothing worked well for any period of time on anything other than completely standard engines, and certainly not performance-orientated engines. I looked at some complex solutions that would make the kit very expensive. I wanted a solution that was effective and didn't cost the earth. I had various design ideas, but needed the help of experts in the seal arena, so enlisted the help of Race Tec, renowned for their work, and specialising in motor sport. Dealing with one of their tech design men and getting a handle on what they could do with seal manufacture, we soon came up with this design. It was thoroughly tested on their in-house jigs before I tested them in 'real life' fitted to engines first on an engine dyno, then in cars on the track. I then enlisted help from various A-series colleagues to test them in various formulae. The results were out-standing. To be able to install this kit, the rear main cap needs the original oil-catcher section machining off so that the rear face is flush with the rear block face. This needs to be done as accurately as possible to ensure the seal is held square-on to the relevant sealing faces. These are the rear face of the oil thrower and the flat journal surface between the end of the scroll and the flywheel boss. An accurate measurement taken from the rear edge outside diameter of the main cap locating dowel holes and rear block face is generally sufficient, but having the block on hand means it can be done with 100% accuracy. Once the cap is machined flat, the five seal carrier retaining screw holes need to be drilled and tapped. This can be done from the drawing supplied, or from very careful positioning of the carrier on the cap and spotting through the holes. If using the latter method take extreme care to get the carrier piece in the correct position in alignment with the carrier that fits to the block. I can have the main cap machined for any customer, providing they can supply me with an accurate measurement referenced from the main cap dowel as outlined earlier. Because both areas the seal lip will be running on are not generally precision machined/ground, some attention to smoothing these areas as much as is feasible will help seal longevity. Assembling the seal to the crank and then fitting the carrier pieces is straight forward. The seal is split to allow it to fit easily over the flywheel boss. It is fitted with the 'open' side of the seal facing the block. Fit with the split uppermost. Apply a small amount of sealant to the ends of the seal, and also to the inside faces of the carriers and carriers to block/cap faces, then assemble the main cap seal carrier to the cap first, leaving it a little loose, then the upper seal carrier to the block. Take care in ensuring the seal is as centred as possible (it sort of does this naturally - but rotating the crank helps further) before fully tightening the carrier retaining screws.